The Hot Knife Heater is useful for keeping Hot Knives hot! Simply plug it in, insert the Hot Knives into the provided slot, and the Hot Knife Heater will keep them ready to use. 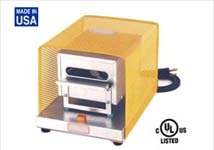 Available in either 115V AC or 230V AC, the hot knife heater can be ordered for your worldwide single phase voltage. We recommend no fewer than three knives, allowing you to re-heat a cooled knife while using one of the other hot ones. Use the knives to trim the ends of freshly-built rollers or remove the applied rubber in the unlikely event of a flawed covering. The heated knife slices through uncured rubber much more easily than a cold blade. If you grind rollers without using coolant, you will need a way of removing the grinding swarf from the grinding machine. A dust collection system that draws swarf away from the grinding head by producing a vacuum is the time-tested method of doing so. A dust collection system should be sized for the number of inlets needed. Contact us for more information. The REMCO Razorback Ring Cutter is an economical solution to removing the cured rubber covering from a roller in preparation for re-covering, or for removing overbuild before grinding the roller to final diameter. The Razorback Ring Cutter is an effective means of quickly removing a large amount of rubber quickly. The rubber often strips from the roller surface in a continuous ribbon, making swarf removal easy. The ring shape of the tool allows a sharp cutting edge to be moved into the cutting position by simply rotating the ring a few degrees. Once all 360° of the ring has been utilized and dulled, it can be easily replaced with a new ring. 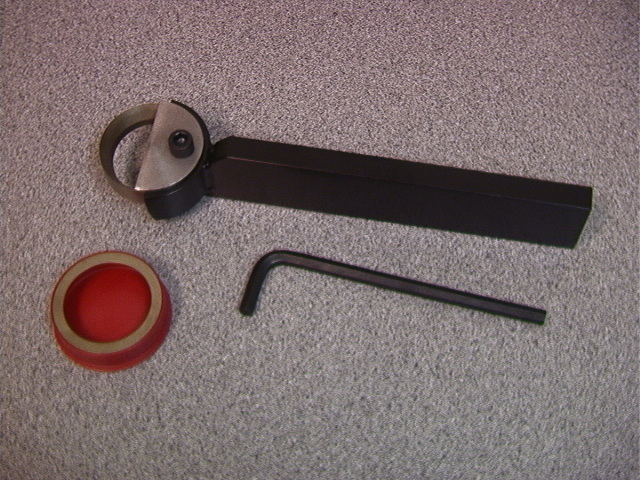 REMCO also provides a Razorback Ring Tool Holder that holds the cutters; see the next item below. The Razorback Ring Tool is conveniently held by a tool we make specifically for that purpose. Simply clamp the REMCO Razorback Ring Tool Holder in a tool post on your stripping machine, install a Ring Tool Cutter, and you are ready to strip rollers.